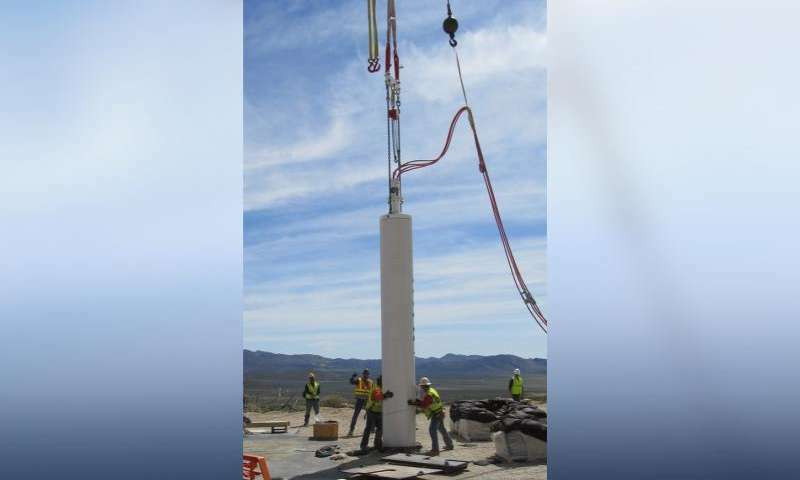 Workers at the Nevada Nuclear Security Site are shown lowering the 25-foot-long Source Physics Experiment (SPE-5) canister into the borehole to its center depth of 76.5 meters or about 250 feet. The SPE shots, including the most recent one on April 26, consist of a series of six underground high-explosive detonations in hard rock that are designed to improve the United States' ability to detect and identify low-yield nuclear explosions amid the clutter of conventional explosions and small earthquakes. "Working at NNSS near the location of previous underground nuclear tests allows researchers to compare data from these conventional explosions with the nearby historic nuclear explosions," said LLNL geophysicist Bill Walter, the chief scientist for SPE-5. "This helps to advance the United States' capability to identify and differentiate nuclear explosions from other background seismic activity, such as mining operations and natural earthquakes. It also improves our capability to monitor the globe for nuclear testing, which state or non-state actors might try to conceal in order to develop or improve their nuclear weapons," Walter said. 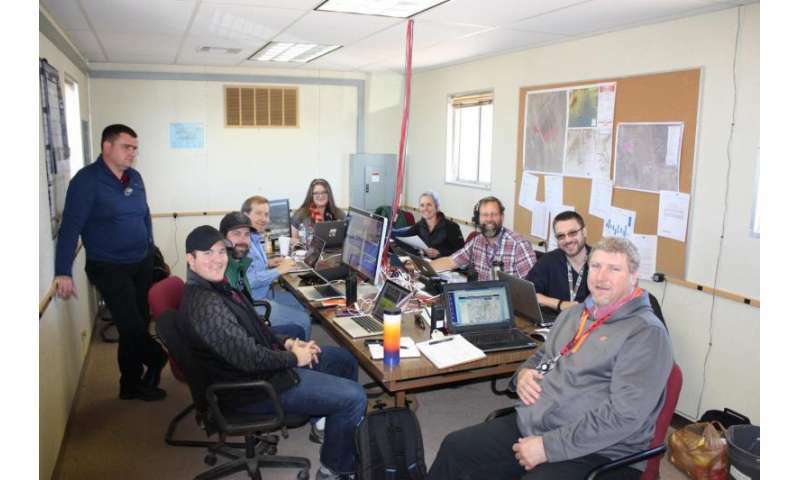 The experiment, sponsored by the National Nuclear Security Administration's (NNSA) Office of Defense Nuclear Nonproliferation R&D, was led by NSTec SPE Campaign Manager Jesse Bonner. The April 26 experiment was a five-ton (TNT equivalent yield) underground chemical explosion, the largest one among the SPE shots conducted thus far. It was placed 76.5 meters – or about 250 feet – deep and hit 2.0 on the Richter scale. "The SPE data is providing incredibly important information about how explosions generate seismic shear waves, also known as S-waves," Walter said. "One initial result from the SPE series is the demonstration that pre-existing fractures in hard rock, known as joints, are a source of S-waves. Granite forms as molten rock and the joints develop in preferred directions as it cools. The explosion shock wave drives motions on these joints that then radiate S-waves in complex patterns," Walter said. "The original development of the historic P-wave models relied heavily on larger explosions at standard depths of burial. The small SPE explosions, at a variety of depths and sizes and recorded on the same sensor network, have enabled the refinement of the historic P-wave models, and are providing the key data to do so. These models are important for estimating the yield of explosions and in determining the detection level of monitoring networks," Walter said. NNSA's three national laboratories have already used the data from the first four experiments in the series (SPE-1, executed in May 2011; SPE-2, executed in October 2011; SPE-3 executed in July 2012; and SPE-4 Prime, executed in May 2015).